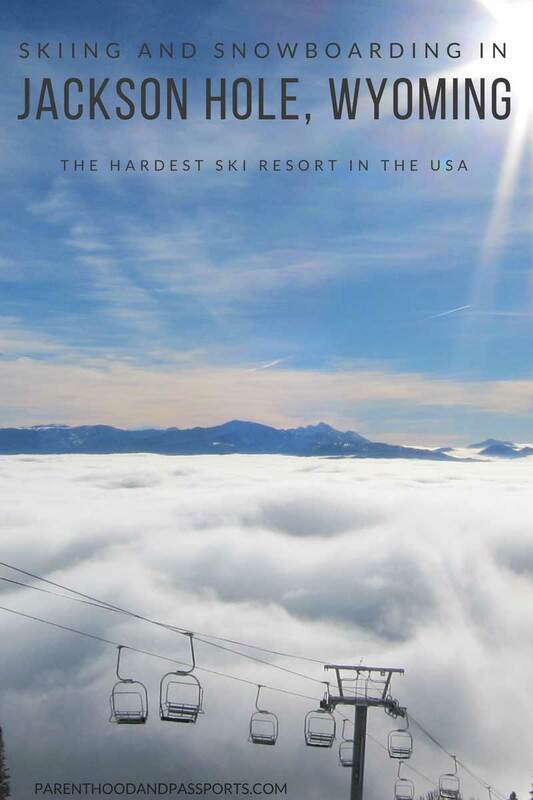 If you are a snowboarder or skier in the United States, chances are you have heard rumblings about the Jackson Hole Mountain Resort. Jackson Hole has a bit of a reputation for its steep runs and extreme exposure. And it’s worthy of that reputation. But skiing in Jackson Hole gives you street cred among other skiers. Once you’ve skied Jackson Hole, Wyoming you could probably ski anything with ease. Jackson Hole is not a beginner’s mountain. In fact, it is probably the most challenging mountain I’ve ever skied. There is a lot of exposure. Cliffs and boulders can sneak up on you and make even an experienced skier a little nervous. Skiing in Jackson Hole is challenging but rewarding. Like most mountains in North America, the runs in Jackson Hole are all color rated. Green runs are the easiest, blues are intermediate runs, and blacks are experienced. In Jackson, you’ll also notice “double blues”, which fall somewhere between intermediate and experienced, and “double blacks” which are for expert skiers only. Jackson is the first mountain where I’ve actually seen black traverses. A traverse is usually a flat narrow trail that takes you from one run to another. What makes a traverse a black, you ask? Part of the reason may be that the traverses only accesses black chutes and black ski runs. But then there is the small, insignificant fact that along one side of the traverse there will be a giant cliff that, should you accidentally ski off, you would inevitably fall to your death. So, yeah, black traverses. What’s a traverse?! 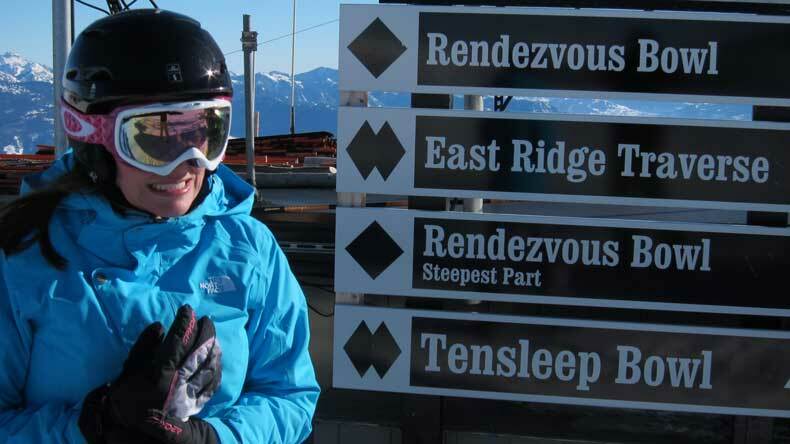 Check out the most common skiing phrases you’ll hear on the slopes and what they mean. 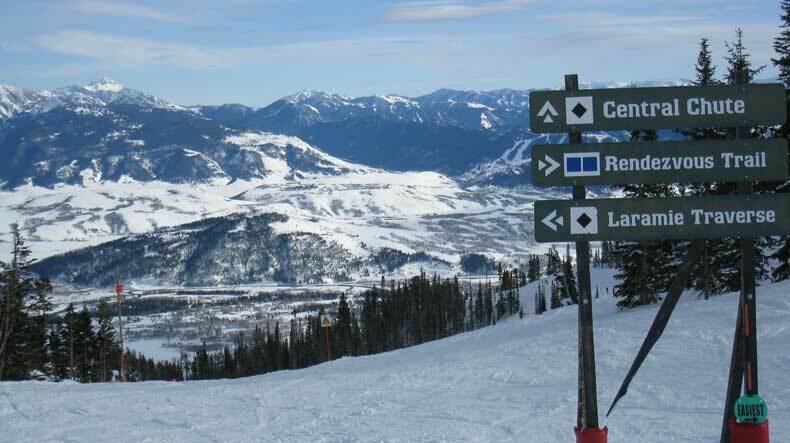 Of the 133 named trails at Jackson Hole Mountain Resort, half are rated black or double black, 40 percent are blues or intermediate runs, and only 10 percent of the runs are greens, or beginner runs. 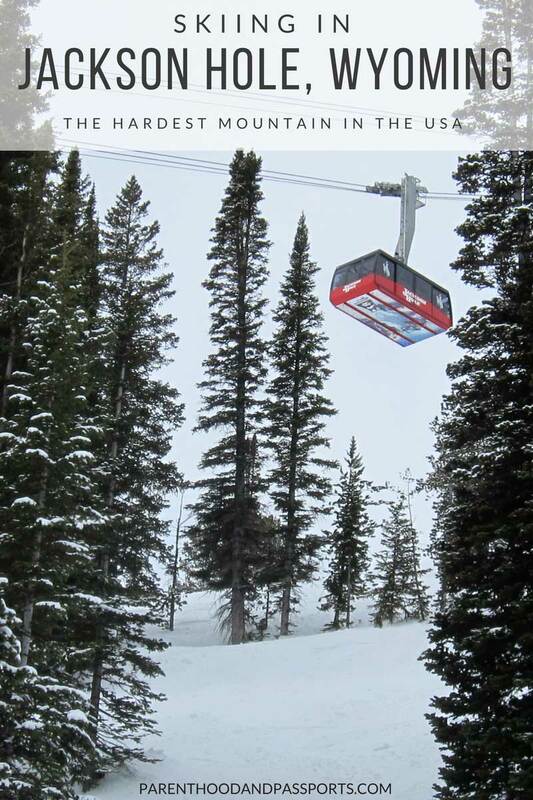 The tram at Jackson Hole accesses expert terrain only. There are ungroomed blacks, double blacks, and gates that access back country skiing from the tram. It also offers the best views of the valley and the back side of the Grand Tetons. Stunning views! The tram also accesses the “scariest ski slope in America”, Corbet’s Couloir. No, I have not skied it, (I’m not that good) and neither has my husband, but there is a fun, easier run right below it where we stood and watched the crazy, extreme skiers risk their lives. My husband, Damon, at one of the gates that accesses the backcountry ski areas at Jackson Hole. From moguls, to chutes, to tree runs, Jackson Hole offers it all. If tree skiing is what you seek (which was once was my favorite type of skiing) there are some great glade runs off the Teton chair lift, which opened in the 2015-2016 ski season. Saratoga Bowl is also known for its great tree runs. For those looking for something really adventurous, there are two terrain parks (one expert, one beginner), a race course, and 4 Burton Stash Parks, which combine natural terrain features and creative wooden elements. Intermediate skiers will find plenty of blue and double blue runs off the Apres Vous and Casper lifts as well as the Gondola. There isn’t a lot of ski-able terrain for the novice skier. However, I actually learned to ski in Jackson Hole, so I wouldn’t discourage beginners from trying out the mountain. All the green runs are located at the bottom of the mountain off the Teewinot and Eagle’s Rest chairs. I would definitely recommend taking lessons if you plan to visit. The children’s ski school area is located in the same building as childcare, which makes it convenient if you have a child in daycare and in ski school. The ski school has a private magic carpet for beginners that is safely separated from the rest of the public ski runs. Once kids are old enough and experienced enough to venture onto a chair lift, they will spend most of their time on the greens at the base of the mountain, until their ski instructor feels they are ready for greens. If you are teaching your kids to ski yourself, this is where you will spend most of your time, as well. I learned to ski in Jackson Hole as an adult. The instructors are very cautious and will not take you or your children outside their skill or comfort level. They are also very knowledgeable. 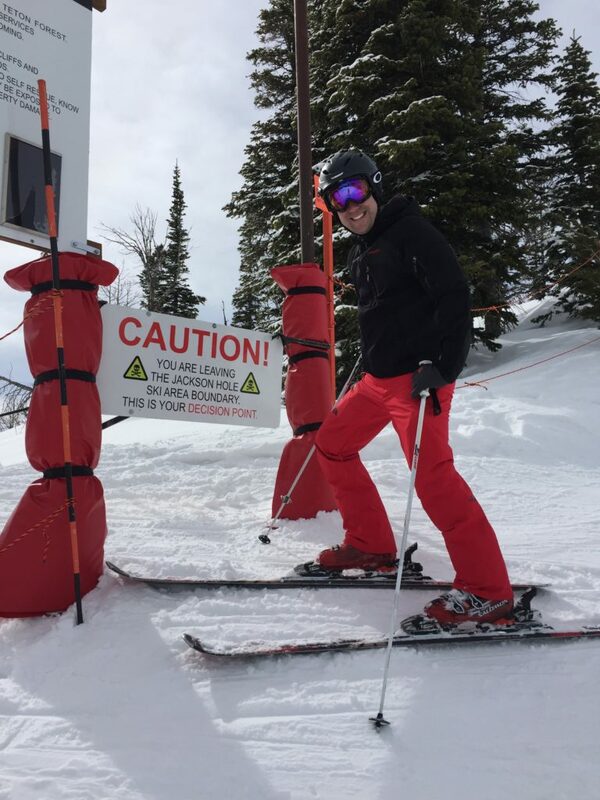 Within a couple days of taking lessons, I was skiing blues in Jackson Hole. And within the same ski season, I was handling black runs at other mountains with caution but ease. Still, to avoid a ski injury on the slopes you need to make sure you are ready and have the necessary skills for the next level of runs. Once you know you or your child can ski in Jackson Hole, every other mountain will seem much less intimidating! When our daughter was still a baby, child care was the single most important aspect for me when skiing. I wanted to know that our daughter was well taken care of and happy in day care. 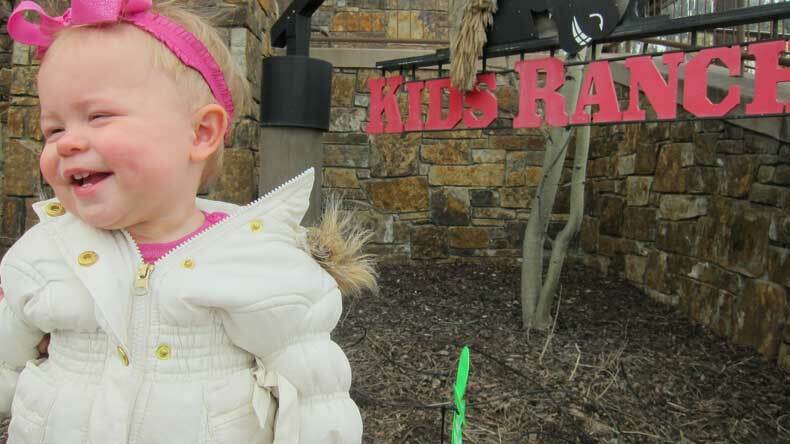 Child care in Jackson Hole set the standard for exceptional day care at all mountain resorts. It is expensive, as are all ski resort day cares. It will cost roughly $150 a day. That does include their snacks and meals. However, if your child is still on formula, expressed breastmilk, or pureed foods, you will need to supply that. Check out these tips if you need to bring any of those liquids on the plane. The Kids Ranch is located inside the Cody building, up the stairs adjacent to the gondola. There seemed to be more than an adequate amount of staff members in the daycare center when we dropped our daughter off. I counted at least five people in the Little Wranglers room. Perhaps putting me even more at ease, there wasn’t a single baby who was upset or crying. They were all playing or being held, and perfectly content. When we picked up our daughter at the end of the day, she was always smiling and happy. The staff gave us a detailed report of her day, what she ate, when she ate, her diaper changes, her naps, how much she drank, what she did, and who she played with. The staff was super attentive, and I could tell our little one enjoyed her time there. Her face says it all! Skiing in Jackson Hole is a challenging yet thrilling adventure. Once you ski Jackson Hole for the first time, you will want to go back. The terrain may be difficult, but conquering this mountain is deeply rewarding! Winter in Jackson Hole is also stunningly beautiful, albeit incredibly cold. 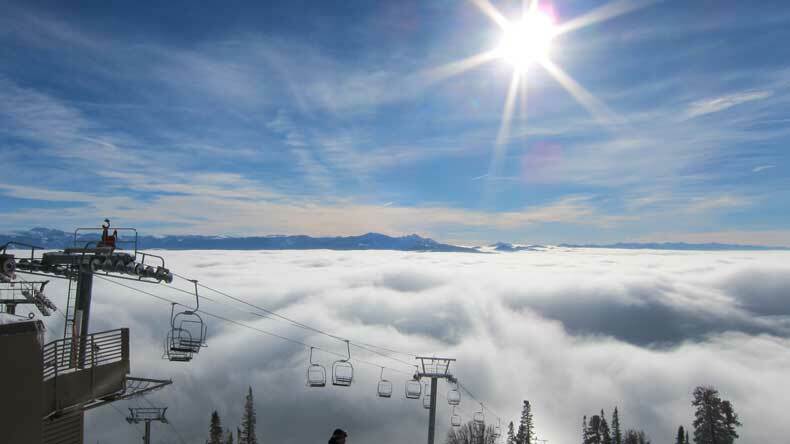 If for no other reason, go skiing in Jackson Hole for the scenery. 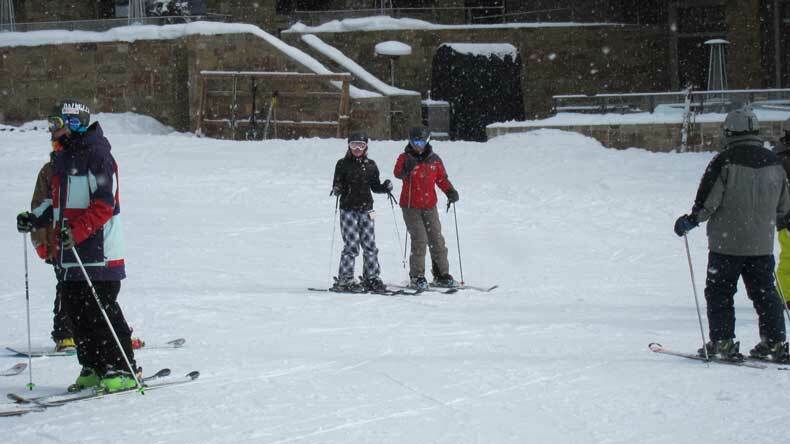 But even if you don’t ski, there are a lot of great winter activities to do in Jackson Hole. Invest in the right ski gear to keep you warm and safe on the mountain. Temperatures can get well below zero degrees Fahrenheit in winter. From unique dining experiences, to the charming Old West town of Jackson, you’re guaranteed to have a great time in western Wyoming. And if you ski or board, you’ll leave with bragging rights and some awesome memories on the slopes. Have a question or comment about skiing in Jackson Hole? We’d love to hear from you. Leave your thoughts in the comments below.